Thanks OP - mine has just turned up and straight onto the stove. Lovely strong coffee from this which I split over two mugs and topped up with hot water - was just right. Will try with pre-boiled water tomorrow morning to save a bit of time. Actually in 2001 that might have been the price - I bought the very small 1 cup one off a market stall 2 years ago for €12 - they were €14 in the supermarket. These last for ever and as I said you can buy replacement handles, seals and screens cheaply in supermarkets in Italy - just make sure you dry it out fully before putting it together for storage. as it can corrode - not a major issue though - just clean with a scourer and your back to normal again. Ta' Will grab them while they're cheaper than usual! Well, sadly, my machine has failed. Went to brew yesterday morning and when I ran a shot, water just poured out of the underneath of the machine instead... It's like a pipe has split or disconnected inside..
Ripperoo: Yep, single wall, double shot basket. Not sure what I have the grind set to (edit: just checked and it's 4), but get consistently good pressure if I give the coffee a good, firm tamping. Saying that, I never use "The Razor", so maybe have a little more coffee on the basket, making a "tighter fit" when the Portafilter is twisted into place. Me too. I found that the puck was slushy and didn't reach the top of the dial. I'm using Amorcaffe. I think my grinder is set to 6 and the outside dial to fine. The razor went back in the box. Yep, single wall, double shot basket. Not sure what I have the grind set to (edit: just checked and it's 4), but get consistently good pressure if I give the coffee a good, firm tamping. Saying that, I never use "The Razor", so maybe have a little more coffee on the basket, making a "tighter fit" when the Portafilter is twisted into place. Thank you. Just want to check with you, you use the single wall double shot basket ? I know i could get better pressure with double wall basket but i've been trying this with the single wall. Yes, I buy beans from a local roastery. It's more expensive than buying supermarket beans but the quality is streets apart. The areopress doesn't make true espresso but then neither does any pod machine. 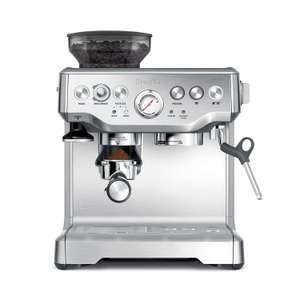 I've heard mixed things about using home espresso machines (Sage, Gaggia etc.) and don't think it's the right thing for me - I'm happy to pay a few quid to get an espresso or latte at a decent (not chain) coffee shop made on commercial equipment by a barista, and use aeropress, v60 or cafetiere at home - all methods are pretty simple, easy to clean up and give good results providing you use decent beans, water and grinder. Just a different way to pods, all methods have pros and cons. Exclusively for Prime SHOULD be in the title! It's regularly below £250 according to the camels but this seems to be the cheapest price for it right now. Mixed reviews, some people love it, others have had issues. 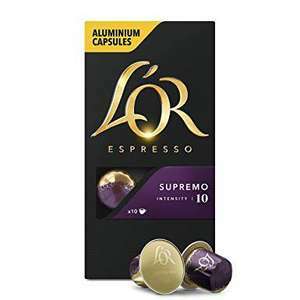 Getting on a bit, but very good espresso for the money. No longer on offer at the lower price. Mine has arrived and everything seems fine. Washed it in hot soapy water ran it through with water first then with coffee. The seals are tight and valve works, no residues or rough areas and the coffee on a medium heat on the Induction hob was quick and delicious - first impressions are a big thumbs up. Never miss a 'Espresso' deal again! Is the steam button pressed in as this is a safety feature where it turns itself off straight away if it is when the machine is turned on? mine looked fab but turned itself off after a couple of seconds! Lucky you. This was mine looked like. Tried this one and honestly wouldn't buy again. I thought it would be something similar to Azera (fine/powder form) - well, it's not and it doesn't taste good either. Will stick with Aldi one :) Voted hot just for the price though! Great price for a great machine! Had mine about 4 years now, used daily and still perfect! Amazon Brand - Happy Belly Coffee Beans "Espresso Crema" (2 x 500g) £7.90 via Subscribe and Save. Anyone tried Costco Columbia beans? Nice dark roast. Highly recommend to fellow coffee snobs. Ah sorry. When I clicked on the link all I could see was multi packs. See my earlier comment about oust. I put it through twice. It is lactic (the 3 sachets), used durgol before, but this seems ok.
Cancelled my order then so. Thanks! Is it used by professionals because someone says it is? Not seeing it listed in commercial suppliers pages. Delonghi, Nespresso, Philips, Saeco, Gaggia all say to avoid Sulphamic acid. Look in your manual. eg. https://www.philips.com/c-m-ho/coffee/home#whatcaniusetodescalemycoffeemachine Some manufacturers still suggest Citric acid based descalers, but they are slow, however it won't do damage. It works pretty well on kettles because you can bring the temperature right up, but it's not much cop for other uses. In my opinion it's very similar, but this stuff isn't quite as smooth. I drink azera intenso and would like to see how this matches up - anyone? I might be talking "Crepe" but am I right in thinking that most of this type of (microground/ instant blend) coffees include around 4% Roast/Ground Coffee with the rest being Instant Coffee ? If so, this one has a "slightly" higher ratio (ground to instant) and as most seem to be 100g containers, and sell for about £4 to £5, this seems good value (taste permitting). Maybe someone could compare Instant Coffee price (x96g) to Roast (x4g) and see how the firms are pitching this ? Voted Hot. mine doesn't turn on at all. gutted! Thanks this was a great find. All mine had was a cracked lid for the water reservoir and no instructions. Decent coffee, thanks again. Received mine earlier, the machine itself is spotless. The box is tatty. Didn’t have any instructions with it so been looking online and testing it out. I like it. First cappuccino is alright, gonna try again later. Any tips from fellow users? There should be done other codes online that work.... I will have a look to. Nice username btw I trust you know your beans. Not difficult to clean! 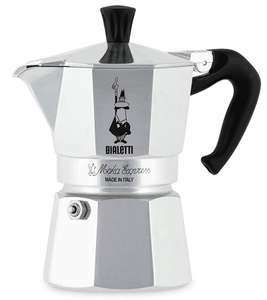 got one of these and they are great, make decent coffee and the frother is very good. The 'milk frother' detaches for cleaning, becoming separate. Such a gruelling five second task. Much easier to clean a separate milk frother than one attached to a machine. Earlier on you tell everyone just to buy a separate milk frother. I take it you clean that after use?